McCourt's Pulitzer Prize winning look back at his childhood. "It was, of course, a miserable childhood: the happy childhood is hardly worth your while..."
"When I look back on my childhood, I wonder how I survived at all. It was, of course, a miserable childhood: the happy childhood is hardly worth your while. Worse than the ordinary miserable childhood is the miserable Irish childhood, and worse yet is the miserable Irish Catholic childhood. People everywhere brag or whimper about the woes of their early years, but nothing can compare with the Irish version: the poverty; the shiftless loquacious father; the pious defeated mother moaning by the fire; pompous priests; bullying shcoolmasters; the English and the terrible things they did to us for eight hundred long years. 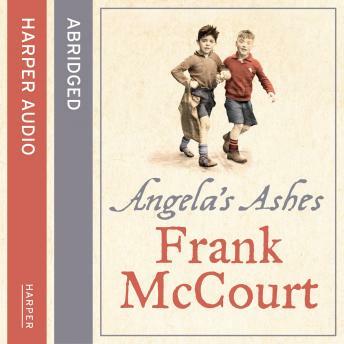 Above all we were wet..."
So begins Frank McCourt's stunning memoir of his childhood in Ireland and America, a recollection of unvarnished truth and no self pity, of grinding poverty and indomitable spirit that will live in the memory long after the tape has ended. Now a major film directed by Alan Parker and starring Robert Carlyle and Emily Watson.